Living By Lysa: Where's Dave? With all the traveling Dave has done recently, that's a fair question! After being in Latvia, Estonia and Prague over the past week, today, he's in Lepzig, Germany with Joel and Ellen Hopkins (pictured with their daughter, Eliana), and Jim and Lina Miller. This team has a vision for reaching out to German young people with the Gospel. 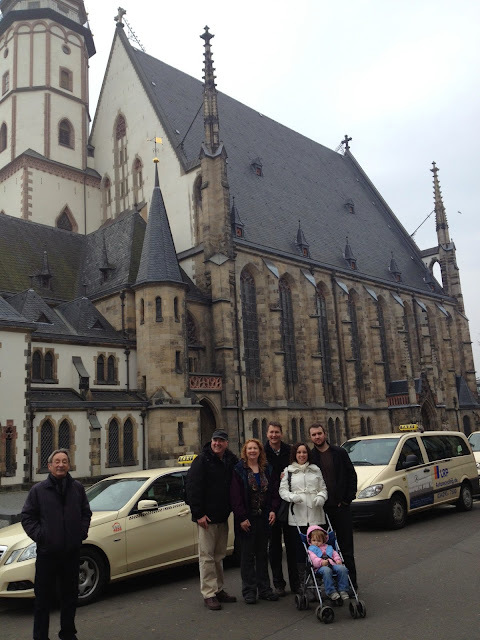 They are in Leipzig meeting with a potential church to partner with. Why Germany? Aren't there lots of churches there? Yes, but they're not filled with many people, especially teenagers. A recent study found that only 8% of eastern German teenagers believe in the existence of God. Church attendance is said to be one of the lowest in Europe with only 5% attending at least once a week. 88% of former East Germany’s population is thought to be atheist, making it one of the most atheistic regions in the world. We're praying for a movement of God among the youth of the former East Germany! Pray that God will give the Hopkins and Miller's a strong church to serve in so that they can be a part of raising up a new generation of believers in that country. What I love about this picture Connie is that Jim Miller is looking over at the German man who isn't standing next to him in the picture. That little piece of the story says a lot about Jim's heart for people. Great story!